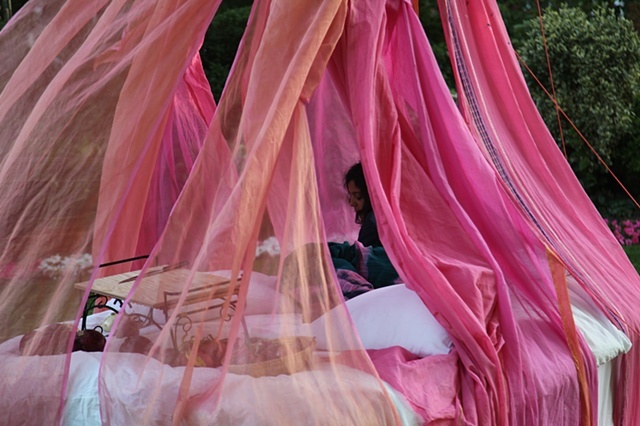 INDELIBLE SCENT was selected as a special project for Art Asia Miami and performed on December 3, 4, and 5, 2012 in the Art Asia/Scope Pavillion during Miami Basel Week. 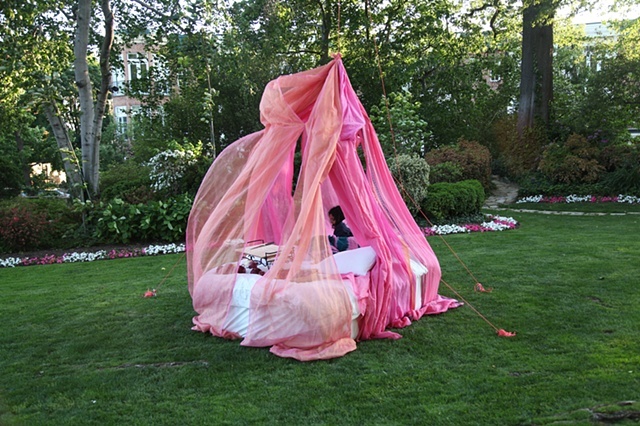 It was first presented at the DC Arts Center's Gala "Cuisine Des Artistes" on May 10, 2012 at Meridien House, Washington DC. 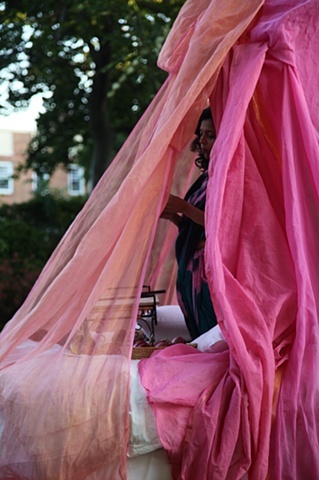 It was also performed at Hillyer Arts Space, Washington DC on December 13, 2012, and on April 13, 2013 as part of the exhibition "Be/Longing " at the Smith Center for Healing and the Arts, Washington DC. 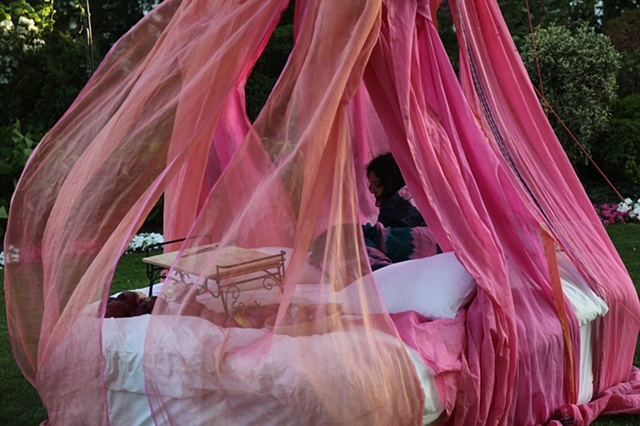 The artist is in the garden in her bed, under a net of glistening pink saris, representing purity and fertility. She is reading “Ka,” Taslima Nasrin’s memoirs which include her sexual experiences, a book banned in Bangladesh and India. In front of her is a pile of onions, some sprouting, which she will cut with a knife. 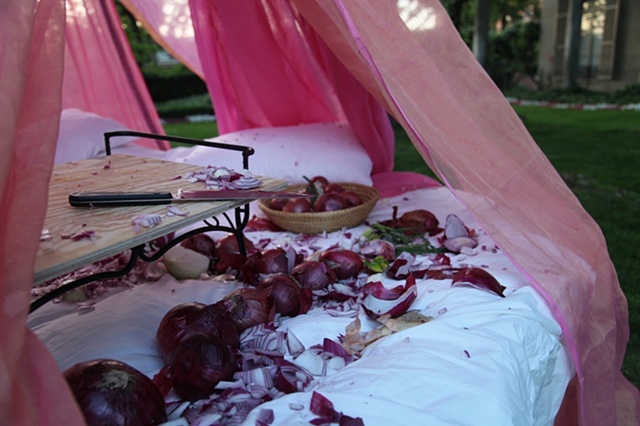 The onions are a metaphor for love. They are forbidden to Hindu widows because they supposedly increase passion. 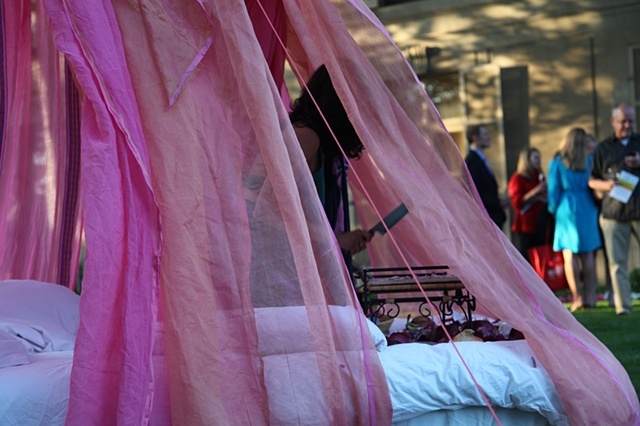 “Indelible Scent” speaks to love, longing, and loss and questions the traditional role of women as passive and chaste. Photo credit: Siobhan Rigg. Photos are from the first performance of INDELIBLE SCENT at DCAC Gala.